What do we miss with exome sequencing? The exome era turns five years old this fall, with the anniversary of the “Targeted capture and massively parallel sequencing of 12 human exomes” [Ng 2009]. Born at a time when whole genome sequencing cost about a quarter million dollars, exome sequencing provided the cost savings that made sequencing large numbers of individuals for research feasible. Here in the MacArthur lab, our rare disease gene discovery projects rely on whole exome sequencing (WES) as a first pass on unsolved Mendelian families. If we can’t find a causal variant, we perform WES on additional family members. If we run out of family members and still haven’t found a likely causal variant, only then do we turn to whole genome sequencing (WGS), often alongside functional analyses such as RNA sequencing from muscle tissue. WGS has remained a last resort for a few reasons: it’s still a bit more expensive than WES, it produces more data we have to process and store, and despite some notable recent advances [Ritchie 2014, Kircher 2014] our ability to interpret the pathogenicity of variants in the 99% of the genome that doesn’t code for protein is still a far cry from what we can do with exons. 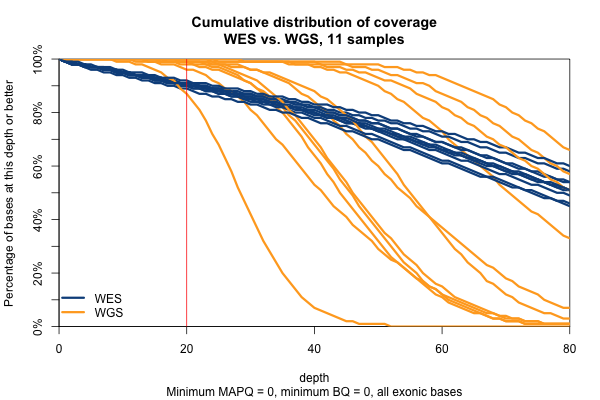 But we still turn to WGS for two main reasons: (1) its superior ability to call structural variations by covering the breakpoints, and (2) its more reliable coverage of the exome itself. We now have 11 individuals from Mendelian disease families on whom we’ve performed both standard WES and very, very high-quality WGS, which gives us a chance to quantify exactly what we’re missing in the WES. The question of what we’re missing in WES is one input to our periodic re-evaluation of whether WES is still the best value for research dollars or if we should be turning to WGS right away. In this post, I’ll explore the “callability” of these 11 WES samples: how much of the targeted exome is covered at a depth where one could hope to call variants, and how many variants are missed, and why? We’ll should say up front that this isn’t a product comparison – the WGS on these samples is of much higher quality than is standard these days, and our exomes are comparatively out of date, so this post cannot directly inform the “WES vs. WGS” decision. Many of the limitations we see in our analysis below are not actually inherent in exome capture but rather relate to PCR amplification or read length. And here are a couple of other caveats: some of the samples were deliberately WGS sequenced at 30x coverage and others at 60x coverage, so the “platinum standard” to which we’re comparing the WES data is a bit of a moving target. Finally, we are only considering one rather outdated exome capture technology (Agilent SureSelect v2) and not a survey of available products; the Broad, for instance, has recently moved to a substantially better capture technology (Illumina’s ICE technology), which we now use as standard for our rare disease patients. We have been working on performing a fairer and more comprehensive comparison of WES and WGS, and the analysis in this post may be considered as a pilot analysis. The code used for this analysis is here; in the post I’ll only present the results. Briefly, I analyzed (1) coverage depth, and (2) called variants. 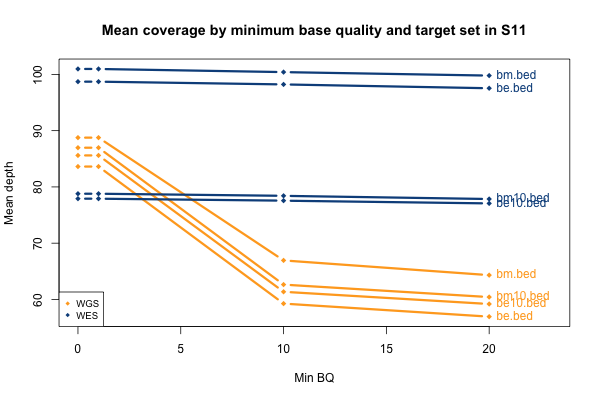 For each genomic interval, in WGS and WES, I then ran GATK DepthOfCoverage for every combination of minimum MAPQ of 0, 1, 10, or 20, and minimum base pair quality of 0, 1, 10 or 20. In other words, I computed the read depth across every base of these genomic intervals, stratified by mapping quality and by base pair quality. For the called variant analysis, I used VCF files produced by GATK HaplotypeCaller. (An important caveat which I’ll repeat later is that the HaplotypeCaller calls were done in 2013 on a now-outdated GATK version and appear to contain a few bugs which may have since been fixed. When we repeat some of these analyses on a larger dataset we will use a newer callset.) I subsetted the variant calls to the Broad Exome and the samples of interest using GATK SelectVariants. I converted them to tables, decomposing multi-allelic sites into separate rows using GATK VariantsToTable, and then converting each allele to its minimal representation. The WES samples had been joint-called with a few hundred other samples, necessitating some further filtering at the analysis stage which I’ll describe below. Again, recall that some WGS samples were sequenced with a goal of 30x coverage and others 60x, hence some of the variability in the height of the yellow bars. 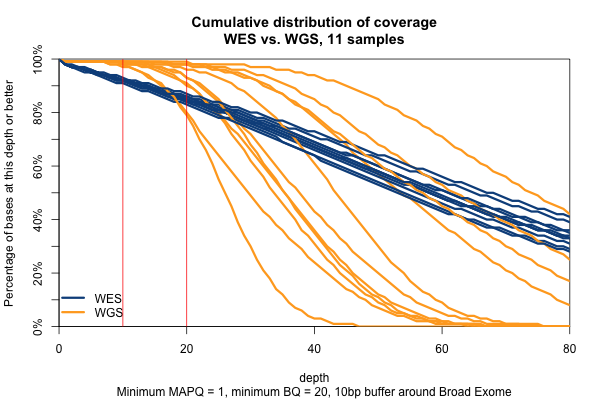 As you’d expect, the WGS BAMs have similar coverage in a 10bp buffer around all exons (or muscle exons) as they do in the exons themselves, while the WES has reduced coverage in the ± 10bp buffer regions. In the few samples with the deepest WGS sequencing (e.g. 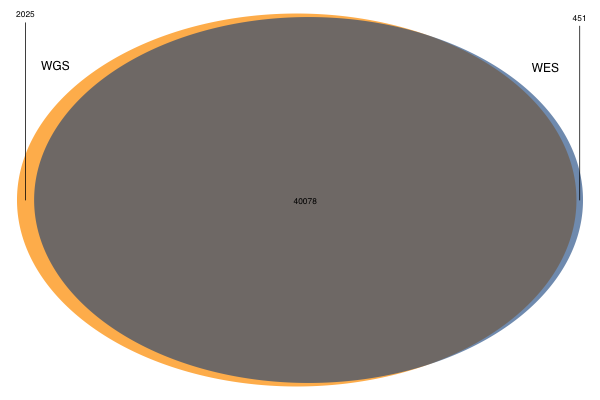 S11), WGS is actually deeper than WES in the buffer regions. All of the above plots are concerning mean coverage across the entire target set. A different metric that might be more pertinent to callability is the percent of the target that is covered at 20x depth or better. 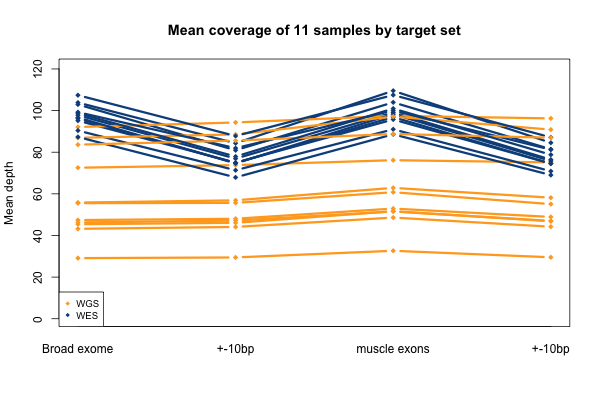 Therefore I computed for each of the 11 samples what percent of the Broad Exome is covered at 20x or better, varying the minimum MAPQ threshold but applying no base quality cutoff. 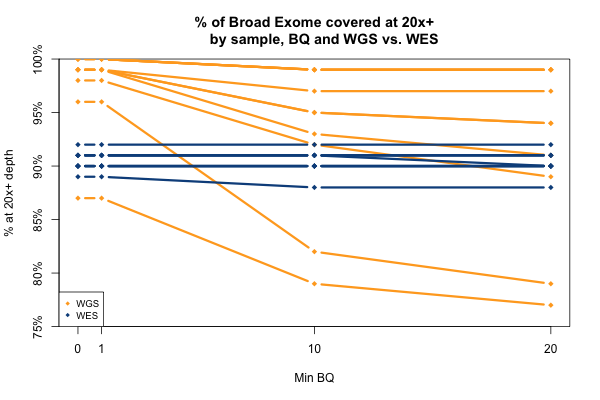 As the plot below shows, all but one of the WGS samples has > 95% of the exome covered at ≥ 20x when all reads are included, while the WES samples cluster closer to 90%. 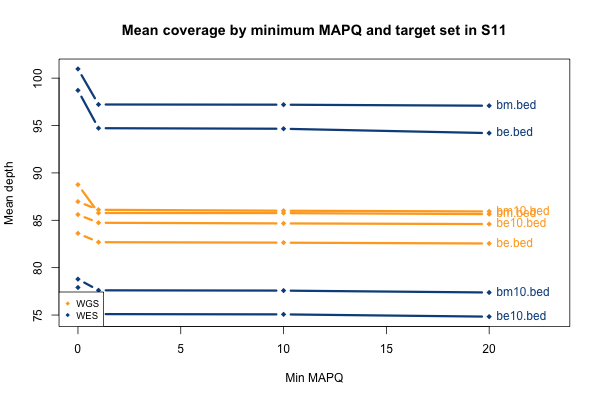 In both cases, you drop below the 20x threshold in about 1% of the exome by requiring that reads have MAPQ > 0. Requiring MAPQ of 10 or 20 doesn’t change things much. All 11 samples are plotted in blue and yellow above — you just can’t see them because they overlap perfectly. In all 11 WGS samples, 100% of the Broad Exome is covered with at least 1 read, but only 99% is covered with at least 1 read of MAPQ > 0. 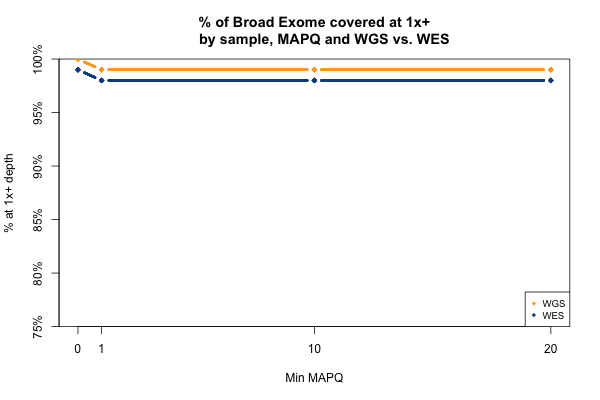 In all 11 WES samples, 99% of the Broad Exome is covered by one read, but only 98% by one read of MAPQ >0. Interpretation: about 1% of the exome is just utterly unmappable even with 250bp reads, and 2% is unmappable with 76bp reads. Remarkably, with just one exception, the WGS samples stay very close to 100% coverage up until about 20x depth, and then each at some point drops off sharply. The WES samples, in contrast, drop off very steadily. That’s bad. The ideal sequencing scheme would have every last base covered at exactly, say, 30x depth – enough to call any variant with high confidence – and then no bases covered at ≥ 31x depth – more isn’t useful. As expected, WGS is much closer to this ideal than WES. Phrased differently, WES has much higher variance of coverage. This is probably due chiefly to capture efficiency, and possibly to some extent due to GC bias during PCR amplification. 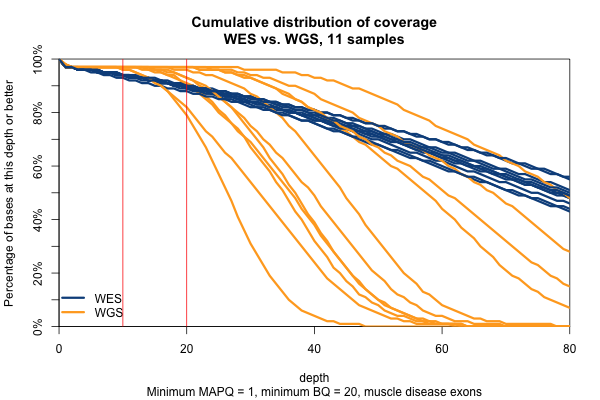 This is why, even though our samples had much lower mean coverage in WGS than WES, the WGS provides us (with one exception) with a larger proportion of the exome covered at ≥ 20x. The picture is similar when we filter for MAPQ ≥ 1 and BQ ≥ 20 (below). The WGS coverage suffers a bit, particularly due to the base quality threshold, so that some of the WGS now have fewer bases at 20x coverage than WES. At 10x, though, WGS is still the clear winner. 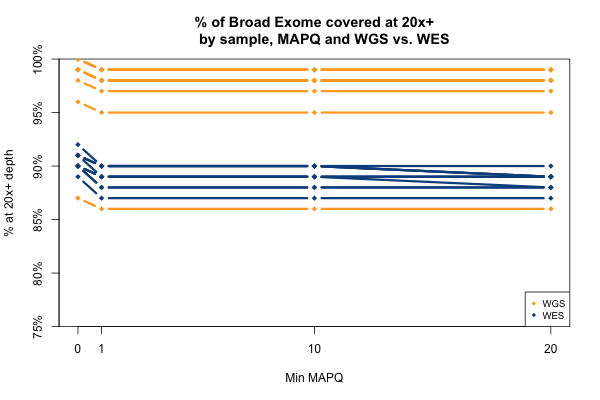 With MAPQ > 0 and BQ ≥ 20, the WGS samples have an average of 98.4% of the exome covered at ≥ 10x, while WES only have 93.5%. So if you consider 10x the minimum to have decent odds of calling a variant, then the combination of longer reads (thus greater mappability) and more uniform coverage in these WGS samples is bringing an additional 5% of the exome into the callable zone. Surprisingly, though we think of muscle disease genes as being enriched for unmappable repetitive regions, the above figure is nearly identical when only muscle disease gene exons are included. As expected, the advantage of WGS over WES is even clearer in the ±10bp around exons, though the shape of the curves is similar. The figure for WGS is precisely in line with expectation: as shown above, WGS brings an additional ~5% of the exome up to a “callable” threshold, so it makes sense that it produces about 5% more alt allele calls. As an aside, of the alleles called in both datasets, WES and WGS called the exact same genotype for all 11 individuals in 91% of alleles. At the other 9% of alleles, WGS had the greater alt allele count 67% of the time. This suggests that even when WES and WGS can both detect an allele’s existence, WGS may have greater power to call the allele in more samples. Next I wanted to dig into the variant calls in a more anecdotal way. Which types of situations are better called by WGS and which are better called by WES? What are the error modes of each dataset? To get at this question, I looked at IGV screenshots of both the WES and WGS reads at sites where a variant was called in one dataset but not the other. I looked at all such discordant sites in muscle disease gene exons (16 sites), and then intended to look at a random sampling of 10 WES-only and 10 WGS-only alt alleles exome-wide, though I ended up doing this a few separate times as I tweaked the filters above. In the final run, with the PASS and genotype quality filters described above in place before the random sampling, I did not notice an obvious difference in the proportion of genotype calls that I concluded looked correct on IGV after viewing reads from both datasets. 6 of the 10 WES-only alleles looked like the correct genotype call had indeed been made based on WES, and symmetrically, 6 of the 10 WGS-only allele calls looked correct. Of the 40% that I didn’t deem exactly correct, most were suggestive of some sort of non-reference allele at the site, it just wasn’t exactly as called by HaplotypeCaller. The number of samples I looked at clearly isn’t enough to be getting into any more numbers, but this exercise was anecdotally very rich. I found it quite illuminating as to some of the error modes of genotype calling and the relative strengths and weaknesses of WGS and WES, and of long reads vs. short reads. Based on all the screenshots I looked at, I would break the discordantly genotyped sites into 7 categories. What follows is a list of these categories, with one example for each, and a description of whether WGS or WES performed better and why. You can click the image to view at full resolution. Based on the coverage analysis above, which indicated that depth is much more variable in WES than WGS, I expected to see lots of these cases, and I did. Here there are only two reads in WES, and both happen to support a C>A SNP, so it was called in WES. My guess is that’s just bad luck – base errors happen in sequencing, and with only two reads, sometimes they’ll happen in the same spot on two reads. In WGS, there was much more depth and no read support for this SNP, so it wasn’t called. I chose this example because it’s interesting to note that the variable depth in WES doesn’t just lead to missed genotypes, it also leads to false positives. As you’d expect, though, there were more cases where a real variant was called in WGS, and was missed in WES due to having only 0 or 1 or 2 reads. Here is one such example if you’re curious. In WGS, this was called as a homozygous alt genotype. Most, but not all, reads support the alt allele; if you look closely, almost 100% of the gray (MAPQ > 0) reads do support the alt allele, while the ones that don’t are almost exclusively white (MAPQ of 0). In the WES, by contrast, there are no gray reads – all the reads here aligned with a MAPQ of 0. That’s because this region is similar enough to other regions that some (not all) 250bp reads can align uniquely, while no 76bp reads can align uniquely. Not only was this not seen as homozygous in the WES data, the variant wasn’t even called at all. A different advantage of longer reads is their ability to span short tandem repeats or homopolymer runs. I looked at these screenshots because the WES data had called a 3bp in-frame deletion that was absent from the WGS calls. On very close inspection, here’s what happened. RRLLLF became RLLLLF – meaning that an R changed to an L, or an R was deleted and an L duplicated, however you prefer to think of it. The WGS data called a MNP in which tandem T>G and C>A mutations turned an R (TCG) into an L (GAG), a reasonable interpretation. In WES, almost half of reads supported that same interpretation, but a subset of reads (6 of them) failed to span the LLL repeat, so they didn’t see that there were 4 Ls instead of 3, and this resulted in a call of a 3-bp deletion of the R. If you look closely, two of these reads spanned into the F after the Ls, and had mismatched bases as a result. The longer reads in WGS, because they spanned the entire repeat region, gave the more correct call. So perhaps it has captured fragments centered further left, such that only their tail ends protrude into the polyA area. Thus making this a fair comparison. There are 7 non-ref bases in just a 12-bp stretch, making this a big MNP or a non-contiguous series of SNPs, depending on your perspective. They’re quite clearly all on the same haplotype. In WGS, they achieve about a 50% allelic balance, and were called as separate heterozygous SNPs. In WES, the allelic balance is way off, with only two alt reads. I see two possible explanations. The density of mismatches may be enough to throw off alignment of a 76bp read but not a 250bp read, or it may be that so many SNPs so close together is enough to reduce the affinity of the DNA for capture probes, introducing bias where the ref allele dominates. This seemed to occur at sites with a massive amount of depth, yet the allelic depth reported by HaplotypeCaller was actually very low – in the individual in the above screenshot, the AD was listed as 2,1. This relates to the next category. A surprisingly common category in the screenshots I looked at was cases where the reads appeared to provide no support whatsoever for the variant that was called. In WGS, a GGT>G deletion was called, and in WES it wasn’t called, but no reads in either dataset seemed to support the variant. On further inspection, the call in WGS was made with AD 6,0 and GQ 41. Now, HaplotypeCaller does perform local realignment at complex sites, with the result that sometimes an IGV screenshot may not reflect the alignment on which the calls were based. However, in the example above, HaplotypeCaller recorded 0 alt alleles, so that can’t explain this call. One caveat for the analysis here is that the variant calls I’m analyzing were performed on a now-outdated version of GATK HaplotypeCaller in 2013 and so may reflect bugs that have since been fixed. Although calls like this with no read support are probably just technical errors, I added this category to the list to remind us that not all of the ~2000 WGS-only alleles and ~500 WES-only alleles reflect differences in sequencing technology – some probably just reflect random error. Here I’ve compared WGS and WES data for the same 11 individuals. The libraries differ in depth, read length and PCR amplification in addition to exome capture, so the comparison will reflect all of these differences. 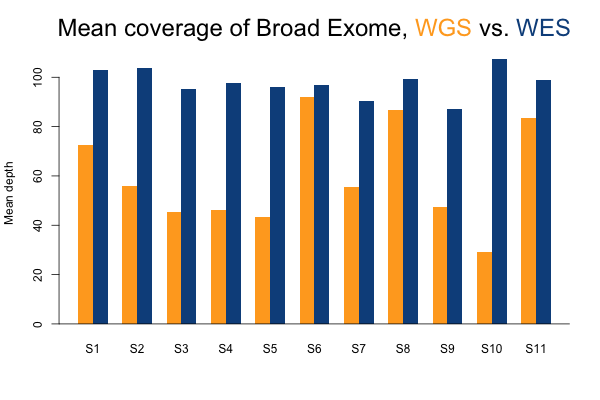 WGS was able to cover 98.4% of the exome at a “callable” depth and quality, while WES covered only 93.5% at the same threshold. This probably reflects the more uniform distribution of coverage in our WGS data due to lack of capture and lack of PCR amplification, as well as the superior mappability of the longer reads. Consistent with WGS covering an additional ~5% of the exome, about 5% of exonic alt allele calls in WGS calls were unique to WGS and were not called in WES. Only about 1% of WES reads were unique to WES. Manual examination of the sites that were discordantly genotyped by the two technologies revealed several explanations. WGS gave superior variant calls where its longer reads gave better mappability or spanned short tandem repeats, where its coverage was more uniform either in total depth or in distribution of the position of a variant within a read, and where it gave more even allelic balance in loci where a high density of SNPs may have interfered with exome capture. WES and WGS both gave spurious variant calls at sites of extraordinarily high depth, and many calls in both datastes were simply not supported by reads at all. Brilliant analysis, thanks for sharing this. You’ve probably also seen the recent paper by Alison Meynert and colleagues at MRC Edinburgh (http://www.biomedcentral.com/1471-2105/15/247/abstract) that has a lot of similar conclusions regarding exome/WGS coverage. Rory in our group also did a nice write up of differences between technical replicates of the same material on 3 different Illumina batches (http://spliced.ghost.io/technical-replicate-concordance-for-wgs/). One useful thing I’d like to do is be able to better annotate variants that might have issues due to repeats (your point 3) and excessive depth (your point 6). For these, we’ve been using Heng Li’s LCR regions to annotate or filter (more details here: http://bcbio.wordpress.com/2014/05/12/wgs-trio-variant-evaluation/). Do you find that helps identify/remove some of your problem calls, or would digging further into metrics to identify these help? I’d love to have a general BED file of regions where we should “look closer at these calls,” ideally for GRCh38 as we move towards that. I finally got around to having a look at this today. I further subsetted the WES and WGS VCFs (which were already subsetted to the Broad exome) to only the Heng Li LCRs. As you’d expect, within these exonic LCRs, performance is considerably worse. Also expectedly, it appears that WGS suffers less than WES in these regions. 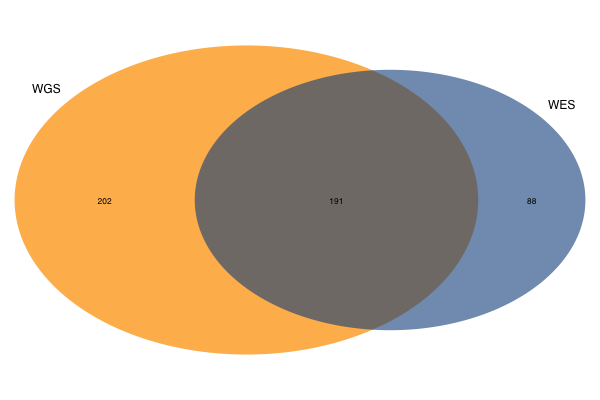 Even among the subset of variants I’ve referred to above as “variants of decent quality”, the WGS/WES overlap is pretty weak – this image shows the analogue of the Venn diagram in this post, for LCRs only. So yes, removing LCRs would definitely improve the metrics a bit, though it probably wouldn’t make a night-and-day difference, since only 1100 of the original ~50,000 variants are in LCRs.